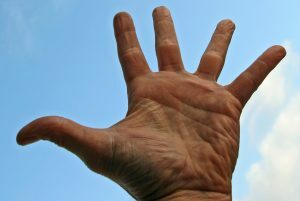 [Everyday] Psychophilosophy » Can You Trust Your Hands? Can You Trust Your Hands? Sometimes, I get bored in class. All right. Often, I get bored in class. But rather than simply sit there and let my brain leak out my ears, I like to do things that keep me stimulated. Engaged. Enthralled. For example, I like to see how long I can hold my breath without having to gasp for air when I stop. Or I like to lean back in my chair and flex my chest muscles to the beat of “Jump On It.” Or, sometimes, I like to try taking notes with my left hand. Now, of those three games: the lamest is also probably the coolest. Well, unless you flip that description in which case it applies to my chest dance. Writing with your left hand (or rather, your non-dominant hand for all you unusual lefties) has been shown to have some interesting effects on people. For example, research done by my own advisers (Dr. Rich Petty and Dr. Pablo Briñol) had participants come into the lab to participate in a study that was “supposedly” about calligraphy. The researchers then had the participants write down positive or negative traits about themselves with either their left or right hand, and afterward, the researchers measured the participants’ self-esteem. That is not proper high-five technique. Who spreads their fingers that far? And what they found was rather curious. Those who used their left hand to write negative traits about themselves had higher self-esteem than those who used their left hand to write positive ones. Why? Well, when you’re writing with your left hand, it’s a little shaky, you’re unsure how to write. So in what’s known as embodied cognition, you interpret the shakiness and unsureness in your behavior to be reflected in your thoughts. That is, using your left hand to write negative traits, makes you doubtful about those negative traits, and thus boosts your self-esteem (i.e. the doubt makes you unsure if these traits apply to you; if they’re really that negative; etc.). On the other hand, being doubtful about your positive traits, lowers your self-esteem (i.e. now you’re not sure if these traits really apply or if they’re even that great). But beyond just writing, the researchers also found that shaking your head (compared to nodding it) likewise makes you more doubtful of your thoughts. In this case, the participants in the study listened to persuasive messages while either shaking or nodding their heads (the participants believed they were in a “theater school” study testing out physical movements). Afterwards, the researchers found that those who had been shaking their head were less persuaded than those who were nodding—again, this effect of embodied cognition the result of inferring your thoughts from your bodily states. Now, in the beginning I said I like to try to take notes with my left hand, which could make me more doubtful of that knowledge; however, I counterbalance this by nodding my head at the same time. Just kidding. Psychology doesn’t work like that. Briñol, P, & Petty, R. E. (2003). Overt head movements and persuasion: A self-validation analysis. Journal of Personality and Social Psychology, 84, 1123-1139.